Visit my store to purchase the blackline printable version of this chart. When it's time to get kids moving and discussing, use this chart to save time in the classroom! 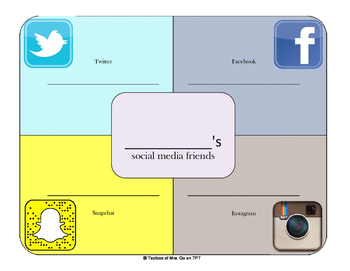 This chart uses icons from the social media platforms most commonly used by teens and is an engaging way to get your students out of their seats and working with somebody new. Helps meet the Speaking & Listening standards for Common Core. 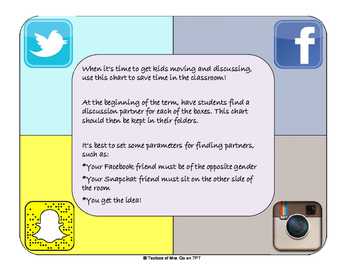 At the beginning of the term, have students find a discussion partner for each of the boxes. This chart should then be kept in their folders.